Groundradar secures new contract with Repsol. Groundradar has undertaken a new contract with the Spanish petroleum company Repsol to survey new well pads in for water migration pathways and possible karstic voids in limestone using UltraGPR technology. This contract follows from numerous successful surveys for other petroleum producers dating to 2008. Minatura has deployed UltraGPR technology on the Sewa River in Sierra Leone to map the depth of water, the locations of dykes and gravel bars and ideally the thickness of gravel over two stretches. Groundradar has previously mapped large segments of the river with commercial radar equipment in 2003 and 2004, but this latest survey extends the coverage both up and down stream. 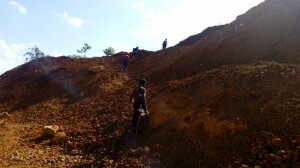 Groundradar’s partner in Indonesia has surveyed a nickel laterite deposit on Sulawesi Island. A widely-spaced grid was used to show the exact thickness of limonite, rocky saprolite and the depth to bedrock. Core Geophysics, based in Perth, has conducted a laterite survey in Indonesia using UltraGPR. The ore volumes calculated from the radar data will be used to determine project feasibility and assist in mine planning. Although the terrain encountered was highly challenging for the radar team, excellent data profiles were acquired. UltraGPR has now been used survey over 23 individual nickel laterite deposits on Sulawesi Island alone.